Washers: 6pcs (red and blue 3pcs each), plastic coated steel. 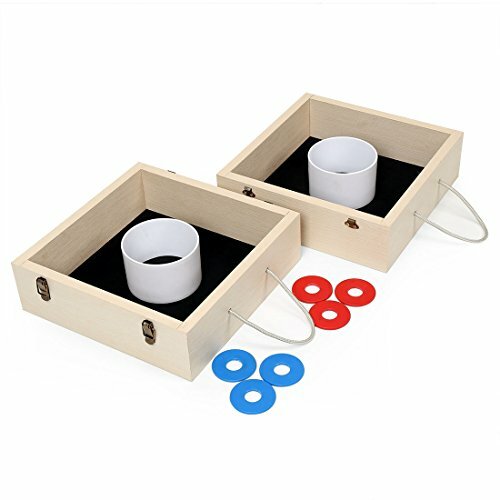 The washer toss set is an interesting game for children and adults. It can make much fun with friends and family playing a classic game of washers! As it is washer box with handle, so you can take it anywhere. It is the perfect game for Lawn,Beach,Parties, Camping, parties, barbecues, cookouts, tailgates, get togethers, weddings, family reunions and more! It is the perfect game for?Lawn,Beach,Parties, Camping, parties, barbecues, cookouts, tailgates, get togethers, weddings, family reunions and more!